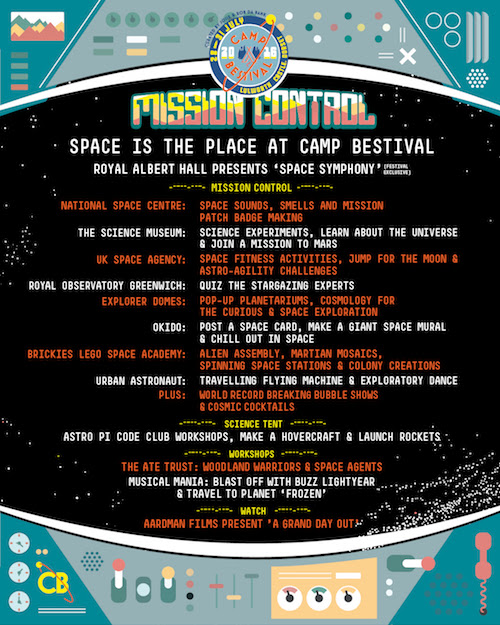 Space is the place at Camp Bestival 2016 with a brand new Mission Control tent added to the already out of this world line up announcements. 5…4…3…2…1… BLAST OFF! Exclusive to Camp Bestival, the Royal Albert Hall’s resident Education & Outreach orchestra, Albert’s Band, will take us on a musical journey to a galaxy far, far away with their Space Symphony. This promises to be the perfect family friendly introduction to some of the most famous and recognised pieces of classical music in the universe, so don’t miss it! Our brand new space-tastic Mission Control tent will play host to a wondrous selection of celestial thrills including the award winning National Space Centre team who will be on hand presenting exciting challenges and intriguing facts to inspire all at Space Camp Lulworth, and you’ll get the chance to win a National Space Centre family pass, too. You can witness science experiments, learn about the universe and join a mission to Mars with The Science Museum. Plus, The UK Space Agency will be taking a leaf out of Tim Peake’s exercise programme with some space-themed fitness and health activities. And don’t miss the Space to Earth Challenge a special space-themed walk around Camp Bestival, where fancy dress is positively encouraged! Come and defy gravity with us. You can quiz the stargazing experts from the Royal Observatory Greenwich, and be inspired by Explorer Dome presents ‘The Wonder of Space’, a family-friendly show produced exclusively for Camp Bestival. Featuring rocket workshops and chemistry shows with freezing fog, fire, flashes and big bangs, you can explore space, stars, life on other worlds, the ultimate fate of our sun, and the sky tonight, with added cosmology for the curious and the chance to ask questions about our place in the universe. There will, of course, be a host of stellar Mission Control action throughout the weekend, with OKIDO Magazine upping the intergalactic ante with giant squishy monsters, a spacey episode of Messy goes to Okido, and a huge, collaborative Space Mural. You can also send a message on a Space-Ready Postcard and work on the longest Space-Themed Bunting ever created. You could also get involved in the greatest building experience in the universe, with Brickies Lego Space Academy and their space-themed LEGO® building workshops, or enjoy Urban Astronaut; a cautionary environmental tale that combines stunning design and a unique, travelling flying machine with simple storytelling and a moving dance performance. Get ready for World Record Breaking Bubble Inc Shows from Samsam Bubble Man, who holds 10 Guinness World Records for Bubbleologist, and Gobbledegook Theatre’s inventive and interactive art that will surprise and delight in unexpected places as they mix up their musical Cosmic Cocktails with Dorset-based group Everyday Sunshine. As ever, The Science Tent will be a mix of science-based performances, timetabled science, technology workshops and drop-in sessions. Be like Tim Peake and join The Rasberry Pi Foundation and Code Club in their Astro Pi Workshops. Explore comets and asteroids, learn how to cook up your own hairy star, make a CD hovercraft, and then make a human hovercraft! Launch a paper rocket, make a sound straw, and join the Silly Science Team’s Slime Workshop. We have tons to stimulate and fascinate every age group...and that includes you mums and dads! You can also let your little stars Blastoff to one of our Musical Mania workshops inspired by the adventures of Buzz Lightyear, or travel to the Planet Frozen, where you will learn the songs, dances and stories inspired by the smash hit Frozen. And, finally for now, keeping the cosmic wonder flowing, we’ll be showing rocket-fuelled entertainment with Aardman Animations’ classic A Grand Day Out with Wallace and Gromit! We’re still counting down to lift-off at Camp Bestival 2016, with so much more interstellar fun and games to be announced, so keep an eye on our website, Facebook and Twitter for all the latest sub space communications. Use our 20 week payment plan to purchase your tickets meaning that an adult ticket can now be bought at a payment of around £9 per week over 19 consecutive weekly payments following your initial deposit payment. Book online via Ticketline only: select 'Camp Bestival 2016 - Weekend Payment Plan'. Once you have signed up to the payment plan, which basically means giving your agreement by ticking the bank mandate form on Ticketline’s website, they will automatically debit your card on a weekly basis. NB: Booking fees and a deposit (£27.50 per adult ticket) will be charged with your initial transaction. More info here.